The Matrix is my favourite movie. I’ve seen it lots of times. And I’m sure I’m not the only one that doesn’t know something. It’s quite embarrassing to admit that I had NO IDEA it was filmed in Sydney, the city we’ve been living in for over 7 months! After spotting a sign on the pavement in Walsh Bay, we decided to investigate the case, and buy the Matrix trilogy on blu ray and discover Sydney from the Matrix perspective. It’s great to watch the film and find buildings we’re passing every day! 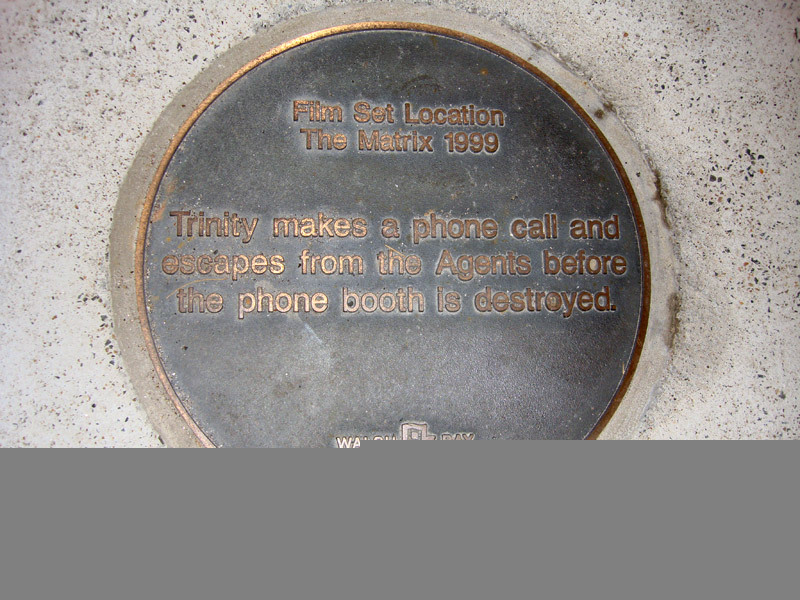 So here at Walsh Bay, just outside the excellent “in the mood for Thai” restaurant, Trinity makes a call and escapes from the Agents before the phone booth is destroyed by a truck. 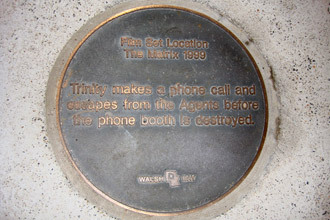 The opening scene of Trinity being chased by an agent across the rooftops was shot in Nashville, Tennessee, USA, but nearly the entire film was shot in Sydney’s Central Business District (CBD). Where Dorota is writing about Trinity’s escape from the Agent above, this is on the corner of Hickson Road, and Towns place which is Millers Point. AON Tower on Kent Street, but the actual Government builing in the Matrix is the Colonial State Bank Centre on Martin Place. Martin Place was also used for the Matrix agent training program. It is the Martin Place Fountain which the lady in red walks past between the men in suits. AND when Neo has deja-vu, sees the black cat, they’ve used the amazing Westin Hotel on Martin Place. Forty One Restaurant, Chifley Tower, which we still haven’t been to. Expensive. Museum Underground Station at Hyde Park, but other Subway Scenes were at Redfern, and the Matix also used the subway station in Rozelle. Just before the end of the film where Neo phones the machines, the phone call took place on the corner of Pitt, O’Connell and Hunter Street. Studios used for the film were Fox Studios in Moore Park and White Bay Studios in Balmain. Some other parts of the film are in Sydney’s suburbs suchas as Waterloo, Chippendale, Surry Hills, Pittwater, Broken Bay, New South Wales, Australia. Does Oz offer any tax breaks to the big studios then? I think I remember reading they shot at least one of the two sequels in Eastern Europe somewhere!! I don’t think there are any tax breaks, from reading the only reason the film was shot here was that the city has a very generic skyline. Well apart from the Centre point tower and the bridge, which in most scenes has been edited out.